Now this coin is an interesting one. 100 kr is a large number for being on a coin. This of course represents the financial situation of Iceland at the time of the coins mintage, but believe me the numbers can be even bigger on coins (this I’m saving for the future). The oddly looking fish, casually swimming to the left is a Lumpsucker fish, and since it’s featured on an Icelandic coin I would presume that they are quite common in the waters around Iceland. 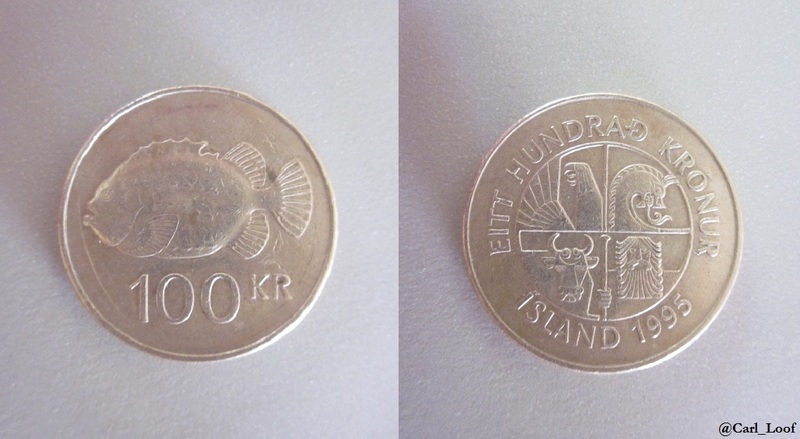 Fish is a common motive on coins from Iceland and this is because fishing is one of the main incomes of the country. The four stylized creatures in the circle on the other side are protectors of Iceland and they are also found in the Icelandic coat of arms. They all represent different geographical areas on Iceland. The screaming eagle is called Gammur, the crazy dragon is called Dreki, the grumpy bull is called Griðungur, and the sturdy old man, which is actually a rock-giant, is called Bergrisi (but I think that he has many similarities with Gandalf from the Lord of the rings. Tolkien was in many aspects inspired by Norse mythology so he might have gotten some characteristics for Gandalf from Bergrisi.